Description: Mike has recently gotten what he hopes to be his last growth spurt topping him out well over six feet tall. He prefers baggy clothing still but given his most recent growth spurt he has difficulty finding anything that isn't relatively tight. He still prefers basic Jeans and t-shirt combos but has added some shirts with color or designs to his formerly black on black wardrobe as he comes further out of his shell. He towers over most of his fellow students and its not hard to place what exactly his powers are just from his appearance. In his efforts to clean up his image he has styled his hair into a short spit curl and usually manages to keep from going out with bed head these days. He moves with confidence much less uncertain and tentative then the boy who came to Claremont a few short months ago. In costume as Phalanx he shows he cleans up quite nicely. 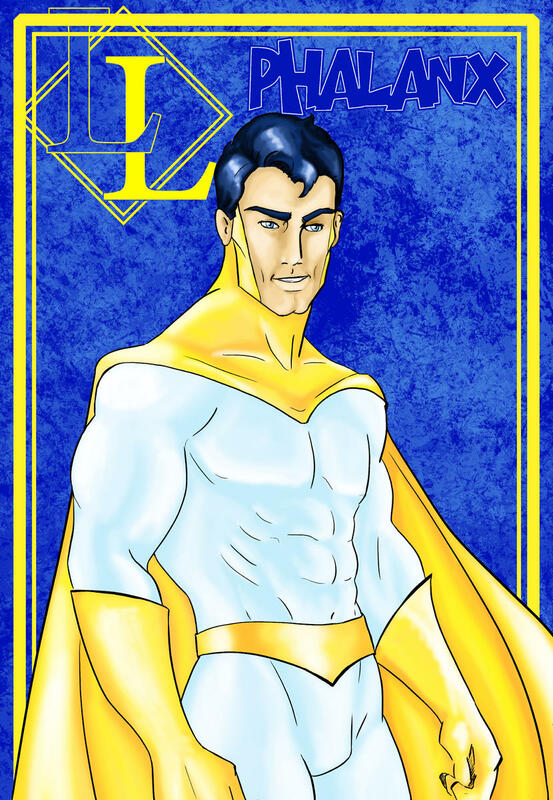 The high collar and shoulders of the costume are in Claremont gold dropping a deep V to his belt of bronzed plates, his Young Freedom Beacon acting as buckle, the rest of the form fitting suit is in deep blue. He pairs this with matching bracers and boots of burnished bronze, and a deep blue full length cape draped from his shoulders. Update 8/2015: The past few years have been good to Mike and his frame if anything has filled out as he has grown into full adulthood. Broad of shoulder and muscular he looks as if he works out regularly to obsesively with a strong squared jaw and well kept close cropped hair. His cloths are now rarely baggy and he carries himself with more confidence though still takes exceptional care not to intimidate or bully people with his size. History: If his parents hadn't been at odds over a natural home birth verses a hospital one Michaels life would have turned out very differently. As it was Melinda Harris found herself, alone thanks to Marvins workaholism, at the hospital birthing class when the invasion started. A portal to the terminus opened in the midst of the room bathing the expectant mothers in the strange energy of that place. Thanks to the quick reactions of her ad hock partner, who's husband also hadn't shown, she survived the assault and together managed to escape to safety. They became fast friends after that harrowing event and once they were born Michael and her daughter Alexandra soon were as well. When the children grew to school age it seemed as if the caution may have been overkill. both children were careful not to reveal that they were different even if they didn't fully understand why. Of course this was more responsibility than a young child really can be expected to bear. It was a normal schoolyard scuffle an older boy took a toy from Alex and Mike told him to give it back Things escalated from there too quickly and the next thing any one knew the other boy was across the room in a heap next to the crumbling wall. Mike was shocked and worried, and more than a little scared. He didn't know what had happened to the boy but he saw the reaction from the other students and the adults. When Alex gave voice to their thoughts his fears were confirmed he had done a very bad thing. For the next ten years he was schooled at a secret ASTRO labs facility under the code name Phalanx. They Tested his abilities and make up charting his progress and trying to trace the energies that granted he and Alex their powers. Through either his mothers determined though limited grassroots campaign or Rebbecas old contacts the children as well as some others the unit had picked up were released to their parents once more and the obvious surveillance removed. Now at nearly sixteen years of age Michael is in a, comparatively, normal school for the first time. He's uncertain about this Claremont academy but happy to have a chance at something like normalcy. Update: Not long after beginning his studies at Claremont academy fate conspired to thrust him and several of his friends into action when a baseball stadium full of spectators was held hostage. After saving the day the groups nominal leader, and Mikes roommate, Edge declared them Young Freedom. They have had several other encounters together and separately with the cities criminal element and usually come out on top. The school sees to it that they are prepared for the journey before them and Mike had flourished under the training and camaraderie of the team. Update 8/2015: After graduating Claremnt Academy Mike went on to get a criminal justice AA and attend the police academy before joining the FCPD. His nature was revealed in short order in a rather spectacularly public manner. No longer able to pretend he can live the simple life Mike is at loose ends as he decides where to go from here. Personality & Motivation: Michael plays the part of the introvert and loner though he does desire companionship he has trouble trusting, both others and himself. He covers for this with acerbic humor and a generally sullen demeanor. Few have worked past his defenses in this regard, and fewer wish to bother, but those that have have made a friend for life. Michael is acutely aware of the destruction he is capable of, perhaps more so than even the testers are, and it terrifies him. He is a good person that truly does want to try and better the world but lives in fear of his own body. He lacks the confidence to embrace his potential instead hiding behind a facade of disinterest and sullenness. However when a friend is in danger, or even insulted, he will weather whatever the world will throw his way in their defense though he won't lash out physically even then. Mike steadfastly refuses to fight thus far, though he has yet to be truly tested in the real world. Update: Mike has come out of his shell with his participation in Young Freedom and he is much less somber when with the good friends he has made there. He still is usually the serious one in the group but will laugh with the others at a well told joke. this newfound camaraderie has strengthened his already strong protective impulse and woe be it to anyone who would threaten his friends. Update 8/2015: Mike has long dreamed of the simple normal life despite events conspiring to make such impossible. After leaving school this desire separated him from many of his school friends and has left him lonelier and more withdrawn. After the debacle of his attempt at being a police officer he is primed to give up the dream of normalcy and fully embrace his heroic identity. With little else left to identify with however he is at risk of losing himself to the job as it were. Powers & Tactics: Mike is a physical powerhouse but usually holds himself back. Since his training at Claremont with Young Freedom his abilities have improved drastically from their untrained state. He is still slow to put the full force of his powers into play but his control now allows him to unleash his full potential when it is most needed. He is always stalwart in defense of his comrades and innocents and takes care to keep collateral damage to a minimum. Phalanx always takes care to keep his strength in check. He will usually open with accurate attacks and against most foes utilize only a fraction of his might so as to make sure he doesn't injure anyone or cause too much damage. OOC he will often utilize less than his full strength bonus on attacks unless he knows the foe can take his full power. Heroes Code: Fully embracing his powers has left mike with feeling a responsibility to do so wisely and justly. Holding Back: Phalanx holds to the genre conventions that you do not open with your most powerful attack. He'll usually pull his early punches and try for non damaging attacks like disarms and grapples until a foe proves too strong or durable at which point he'll begin to ramp up. Overbooked: Going back to school full time and a life of crime fighting don't go hand in hand, while super speed may help him keep up he can't be in two places at once. Secret Identity: One of the worst kept secrets but technically true. After his recent exposure out of costume the chances of being recognized increase. Registered: full records of who mike is are available to those with sufficient clearance. Responsibility: Alex, his girlfriend, and Zoe, his daughter from the future. Strength and Con: These should be noted by the nember you have not the modifier it will give you. "Enhanced Attribute: Strength 9 " should be "Enhanced Attribute: Strength 18 "
Defense: Looks good, but I must mention you'd save yourself a point if you bought yourself an even numbered defense and dodge focus 1. Not that you have to do it, just a suggestion. Speed: Please note how fast you go. Super Senses: Who's the Link with? Super Strength: See your combat section. Took your suggestion on defense to add bracing back in to superstrength (lost it in one of the various point adjustments). Comunication link is as now noted with Psyche. Edited the enhanced attributes and added his speed to the speed entry Also added it to his flight. Just change up the Enhanced Defense to match the new score and you'll be good to go. Fixed a miscalculation on Knockback. Didn't realize impervious toughness wasn't cut in half. Okay, just three more things, a couple of questions and a request. Question #2: What exactly do you plan to do with this character? He doesn't fight... so what's he do? Why would other people call him a hero? Request: bold the names of his powers, and bold & underline the "section headings" (stats, combat, saves, skills, etc. ), please. The defense is there becasue I see it as being thematic that his defenses are from his powers more than native ability. Kinda like a combination of improved reflexes and improved senses to notice attacks etc. As for what he'll do is he'll grow into the Hero he can be. He's kinda messed up in the head right now but deep down he has the drive to help people and if he's honest with himself he dreams of being a Hero. Right now he's stuck on this idea that its too dangerous, basically he's affraid to use his powers for fear of colateral damage but if debris from a colapsing building is gonna fall on bystaders or villians are threatening inocents he'll step up because he deep down can't just stand by. He's young and frightened right now but he has it in him to be a big time Hero if he gets over himself. So thats kinda the RP road ahead for him. He's early career spidey or supper boy. He wishes he could just be normal/live a normal life but its not in the cards because he isn't normal, he has the power to make things better and his morals in the end won't let him not do so. Alright, we'll give 'im a test run. Approved! Description: Mike has recently gotten what he hopes to be his last growth spurt topping him out well over six feet tall. He preffers baggy clothing still but given his most recent growth spurt he has difficulty finding anythign that isn't relitively tight. He still preffers basic Jeans and t-shirt combos but has added some shirts with color or desighns to his formerly black on black wardrobe as he comes further out of his shell. He towers over most of his fellow students and its not hard to place what exactly his powers are just from his appearance. In his efforts to clean up his image he has styled his hair into a short spit curl and usually manages to keep from going out with bed head these days. He moves with confidence much less uncertain and tentative then the boy who came to claremont a few short months ago. History: If his parents hadn't been at odds over a natural home birth verses a hospital one Michaels life woudl have turned out very differently. As it was Melinda Harris found herself, alone thanks to Marvins workaholism, at the hospital birthing class when the invasion started. A portal to the terminus opened in the midst of the room bathing the expectant mothers in the strange energy of that place. Thanks to the quick reactions of her ad hock partner, who's husband also hadn't shown, she survived the assault and together managed to escape to safety. They became fast friends after that harrowing event and once they were born Michael and her daughter Alexandra soon were as well. Much to Marvin and Melindas relife it at fist seemed the energies of the Terminus had had no effect on Michael, that was not to last however. He was certainly big for his age and strong too, though as doting parents they thought it well within the norm, then one day when Melinda was trying to get him to nap he floated up and out of the crib to continue his interupted playtime. His parents made immediate efforts to make sure he would keep his abilities a secret they didn't know what else to do. When Melinda confided in her friend rebecca she learned that little alex had powers as well, the children spent even more time together from that point on as the parents could trust one another with each others secrets like they could few others. When the children grew to school age it seemed as if the caution may have been overkill. both children were carefull not to reveal that they were different even if they didn't fully understand why. Of course this was more responsability than a young child really can be expected to bear. It was a normal schoolyard scuffle an older boy took a toy from Alex and Mike told him to give it back Things escalated from there too quickly and the next thing any one knew the other boy was across the room in a heap next to the crumbling wall. Mike was shocked and worried, and more than a little scared. He didn't know what had happened to the boy but he saw the reaction from the other students and the adults. When Alex gave voice to their thoughts his fears were confirmed he had done a very bad thing. For the next ten years he was schooled at a secret ASTRO labs facility under the code name Phalanx. They Tested his abilities and make up charting his progress and trying to trace the energies that granted he and Alex their powers. Through either his mothers determined though limited grassroots campaign or Rebbecas old contacts teh children as wel as some others the unit had picked up were released to their parents once more and the obvious surveilance removed. Now at nearly sixteen years of age Michael is in a, comparatively, normal school for the first time. He's uncertain about this Clairmont academy but happy to have a chance at something like normalcy. Update: Not long after begining his studies at Claremont academy fate conspired to thrust him and several of his friends into action when a baseball staduim full of spectators was held hostage. After saving the day the groups nominal leader, and Mikes roomate, Edge declared them Young Freedom. They have had several other encounters together and seperately with the cities criminal element and usually come out on top. The school sees to it that they are prepared for the journey before them and Mike had florished under the training and comraderie of the team. Personality & Motivation: Michael palys the part of the intorvert and loner though he does desire companionship he has trouble trusting, both others and himself. He covers for this with acerbic humor and a generally sullen demeanor. Few have worked past his defenses in this regard, and fewer wish to bother, but those that have have made a friend for life. Michael is acutely aware of the destruction he is capeable of, perhaps more so than even the testers are, and it terrifies him. He is a good person that truely does want to try and better the world but lives in fear of his own body. He lacks the confidence to embrace his potential instead hiding behind a facade of disinterest and sulleness. However when a friend is in danger, or even insulted, he will weather whatever the world will throw his way in their defensethough he won't lash out physically even then. Mike steadfastly refuses to fight thus far, though he has yet to be truely tested in the real world. Update: Mike has come out of his shell with his participation in Young Freedom and he is much less somber when with the good friends he has made there. He still is usually the serious one in the group but will laugh with the others at a well told joke. this newfound comraderie has strengthed his already strong protective impulse and woe be it to anyone who would threaten his friends. Powers & Tactics: Mike is a physical powerhouse but usually holds himself back. Since his training at claremont with Young Freedom his abilities have improved drastically from their untrained state. He is still slow to put the full force of his powers into play but his control now allows him to unleash his full potential when it is most needed. He is alway sstalwart in defense of his comrades and innocents and takes care to keep collateral damage to a minumum. Your powers come out to 103PP, not 104. You short-changed yourself a little. The rest of the math checks out. Putting absolutely nothing in his Reflex save makes me uncomfortable. But characters with +0 in a save have been approved here before, so there is (unfortunately) an existing precedent, and I will honor it. And this is such a tight build, I don't know what I would drop to make room for it anyway. It is a damned good Paragon build. At some point, you might want to consider adding Immovable (Extras: Unstoppable) [2PP/rank] as another DAP in the Paragon array.